Exactly one month ago clients of ReSolve Asset Management received our 2015 annual letter, entitled “Navigating Active Asset Allocation When Diversification Fails”. People who signed up for our email distribution list received it a few days later. If you would like to receive premium content in a timely manner, we invite you to sign up and download the full report here. 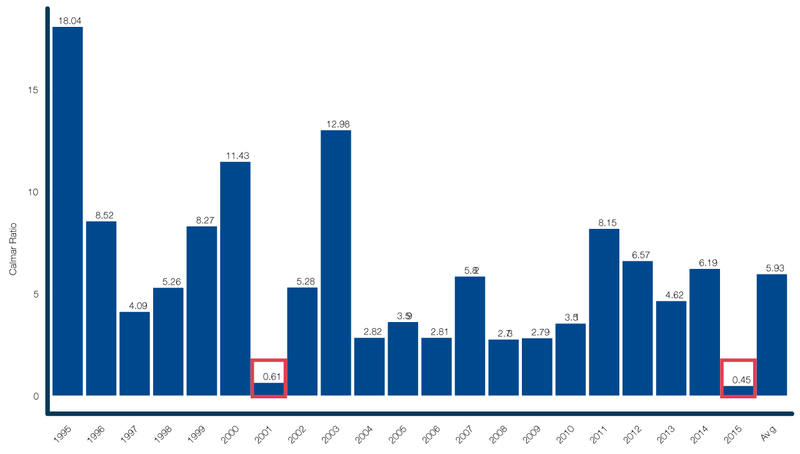 End of year letters are traditionally structured as narratives connecting the events of the past year with what investors have experienced in their own portfolios. This formula is quite effective, as investors are humans, and the human mind is engineered to interpret and describe the world in terms of a linear series of events linked by cause and effect. And why not? After all, for approximately one hundred thousand years, between the time that modern humans developed a pre-frontal cortex and 6000 BC when the Egyptians invented papyrus, stories were the only way to convey knowledge across space and time. Stories are also comforting. By linking portfolio outcomes with a specific sequence of events, we inherently feel that we can identify patterns when they occur the next time, and thus make better choices. It follows that by observing these relationships as they evolve through time, we gain valuable experience, which will help us to predict future events, and generate better portfolio outcomes. Unfortunately, the perception that a better understanding of market events leads to greater control over portfolio outcomes is an illusion. Markets are wildly unpredictable and rarely conform to the narratives which inform our expectations. As such, when a series of events today seems to match closely with a similar set of events in the past, this knowledge provides very little insight into how markets will respond to these superficially parallel circumstances. There are statistical reasons why this must be true (which are beyond the scope of this letter), but suffice it to say that the range of outcomes is often so high that an investor’s best course of action is to assume a random outcome centred on the markets’ recently observed behaviour. Since we know that spinning a narrative about the past year won’t help you truly understand what happened in your portfolios, we will leave the storytelling to more gifted minstrels. Instead, we will explore a detailed analysis describing the characteristics of last year’s markets that actually mattered to portfolio performance. At ReSolve, we decided a long time ago that we don’t want our clients to experience 25% to 50% losses every 5-7 years when equity markets around the world are rocked by major bear markets. That’s why we employ globally diversified solutions which adapt in real time to material changes in global markets. While diversification and adaptation won’t work all the time, our objective is to deliver positive performance over 90 percent of 12-month periods, and over 99 percent of three year periods. While this might seem like a lofty goal, our confidence stems from several qualities that are unique to our approach. For example, since we allocate across a variety of asset classes around the world which thrive for different economic reasons, and at different times, there is almost always an asset class that is prospering. Consider that in 2008, when most global stock, real estate, and commodity markets dropped 50% or more, U.S. benchmark Treasury bonds rose over 20%. Of course, there are rare periods which offer no place to hide. It turns out that calendar 2015 was one of them. And in fact, the past year was challenging for a host of other reasons as well. In this document, we will examine many of the drivers that make globally diversified strategies work, and show why 2015 was especially challenging in each case. We will also discuss some techniques that active global strategies might consider in order to produce better outcomes in similar periods going forward. As mentioned above, the first major challenge to diversified mandates over the past twelve months was the near complete absence of meaningfully positive returns across global asset classes. It turns out this is actually quite unusual, as most years offer at least one or two sources of strong returns for agile asset allocators. A historical case study will help put the past year’s dearth of returns in context. Imagine that on January 1st of each year, we knew in advance which major global asset classes would deliver returns above the group’s average, as well as positive returns, in the coming year. Of course, knowing the future in this way is impossible, but it helps to illustrate the available opportunity set for an active long-only global asset allocation strategy. Perhaps unsurprisingly, an investor with this type of perfect foresight – who allocated capital equally among the top half of positively performing assets each year – would have produced average annual returns of 22% since 1995. 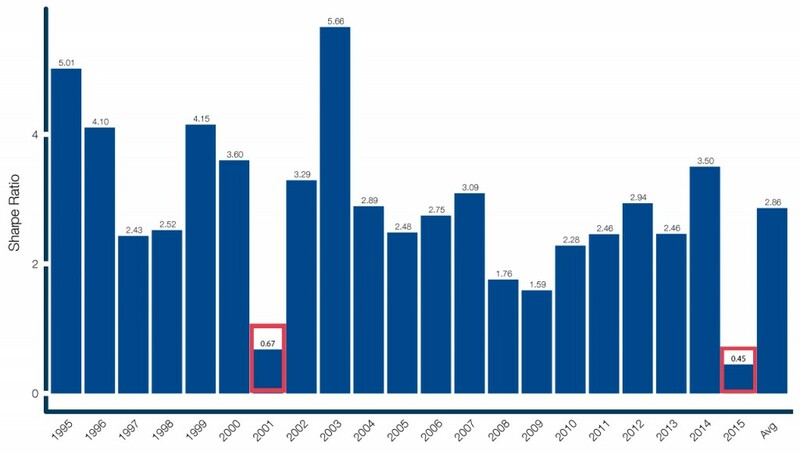 Moreover, as can be seen in Figure 1., this strategy would have generated returns over 15% in 16 out of the 21 years, and gains of more than 10% in 19 of the 21 years. Fully 1/3 of the years provided returns of greater than 25%! Any investor in his right mind would gleefully invest in this ‘crystal ball’ strategy. Figure 1. Average annual returns to asset classes with above average and positive returns. Source: ReSolve Asset Management, 2015. Data from CSI. And yet, even with perfect foresight, this strategy would have struggled this year. Through December 28, 2015, the average performance of top half assets with positive returns was a measly 0.6%, even including all dividends and interest payments. In fact, per Figure 2., almost half of global asset classes produced negative returns on the year. 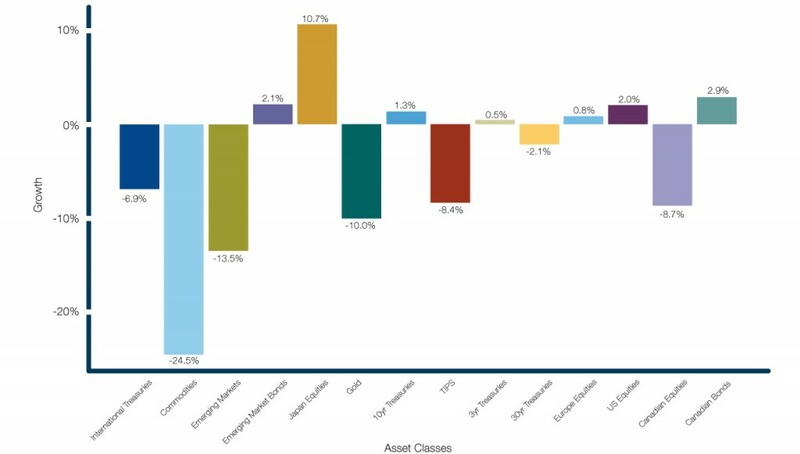 The average return across all asset classes shown was -4%. Figure 2. 2015 Average 2015 total returns to asset classes. The top performing asset class, Japanese equities, returned 10.7%. However, investors in Japanese equities had to endure a 16% peak-to-trough loss from April through September in order to enjoy the end-of year bounce into positive territory. US stocks were the second best performing asset class, with just 1.3% returns, but with a similarly precipitous drop mid-year. Let’s take our crystal ball analysis one step further, and imagine that in each year we knew not only the assets with the best returns, but also the portfolio with the best return in relation to the amount of risk you had to take to achieve the return. This is equivalent to knowing the mix of assets each year that produced the maximum Sharpe ratio, which is the ratio of the portfolio’s return to its volatility. 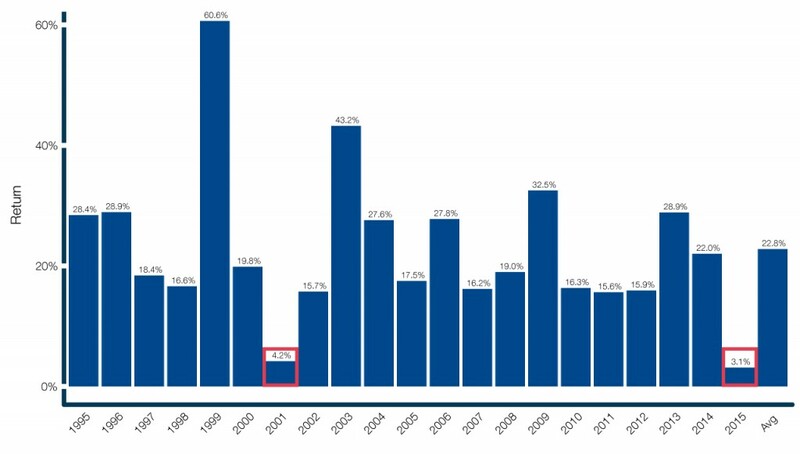 Figure 3. shows that in a typical year since 1995, markets offered investors with perfect foresight the opportunity to earn 22.8% returns on the most efficient portfolio. By contrast, in 2015 the perfect foresight ‘maximum Sharpe ratio portfolio1 would have generated just 3.1% growth. As a result, per Figure 4., the optimal portfolio delivered just 0.45 units of return per unit of risk in 2015, relative to 2.86 units of return per unit of risk in a typical year. To make matters worse, average peak-to-trough drawdowns were worse than average in 2015 for most asset classes, which meant investors were not well compensated for enduring losses, as quantified in Figure 5. Figure 3. Calendar year returns for optimal Sharpe portfolios given perfect foresight. Figure 4. Calendar year Sharpe ratios for optimal portfolios given perfect foresight. Figure 5. Calendar year returns/drawdown ratio for optimal portfolios given perfect foresight. We performed one more novel analysis which demonstrates how awful the opportunity set really was in 2015. Each day from 1995 through 2015 we constructed robust maximum Sharpe optimal portfolios based on averaged 1, 3, 6, 9 and 12 month lookbacks. Then we used a standard t-test to determine the probability that each constituent asset had positive and above average returns. Finally, we used the optimal weights and the probability values to find the weighted average probability that the optimal portfolio exhibited statistically significant positive momentum. The results are plotted in Figure 6. 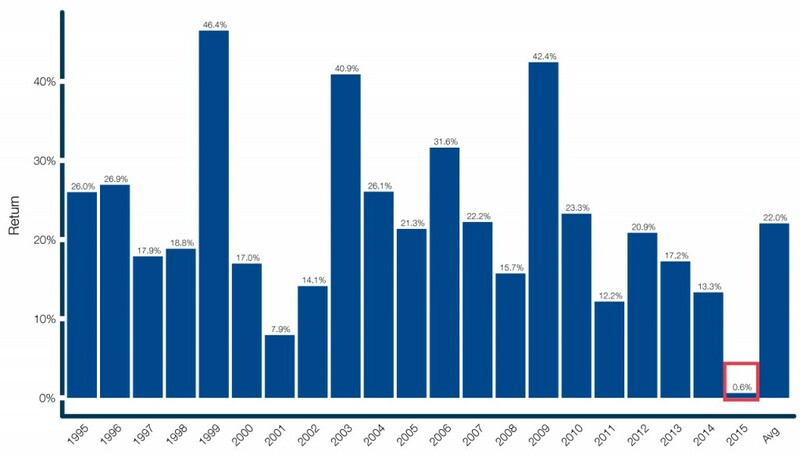 Note that, with the exception of a brief period in early 2009, the back half of 2015 presented the least significant positive returns over the past 21 years. Figure 6. 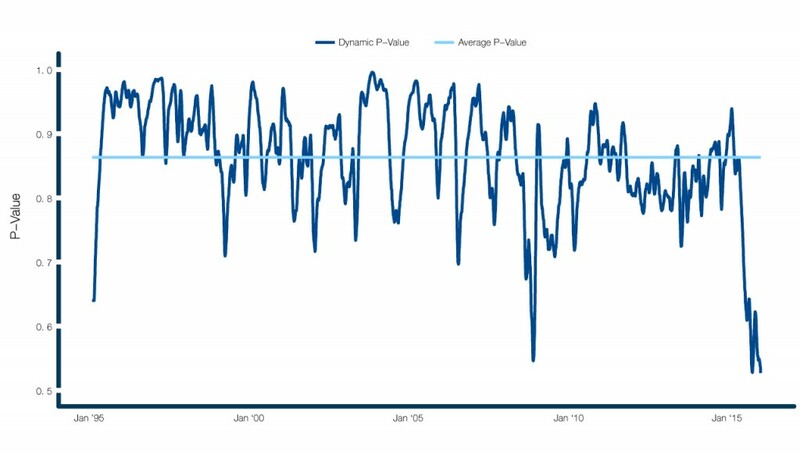 Weighted average probability that optimal portfolios exhibit positive momentum. A universal shortage of return opportunities is enough to confound most globally diversified strategies. But it turns out that 2015 was challenging for other reasons as well. One special complication relates to the fact that assets’ returns were closely bunched together, making it difficult for more active strategies to choose between them. If assets have very similar returns across most momentum lookbacks, momentum oriented strategies will trigger a large number of unproductive trades as assets make small moves above or below each other in quick succession. Figure 7. illustrates how equity-like assets’ returns in particular crossed each other many times throughout the year, and were especially entangled during the most difficult period from August through October.